They hung the Unregistered in the old warehouse district; it was a public execution, so everyone went to see. I stood at the back, a nameless face in the crowd, too close to the gallows for comfort but unable to look away. I have seen a few posts comparing this to Julie Kagawa's first series, The Iron King. I haven't actually read it, so I can't comment. I felt like I was going into it blind, a whole new world about to open up for me. From the first sentence you are thrust into a really atmospheric scene and you wonder what you have let yourself in for. The tension building was amazing. For the first couple of chapters, as each ended with a powerful hook, I was so caught up in the drama, I held my breath. One day one of these books is going to cause me severe asphyxiation! A really powerful start to the book that made me rethink my whole opinion of vampires. I was a little dubious to read this to begin with, I mean vampires have been written to death, but Julie Kagawa surprised me with her version of them. If you are looking for the Twilight style human huggers, head straight for the exit, because you are likely to lose a bucket full of blood if you even look at these vampires the wrong way. These vampires are nasty and just love to play cat and mouse! Put them alongside the rabids and you are doomed! I really loved the author's take on vampires, definitely old school. I loved Alison! She was one hell of a girl. There is no room for naivety in her life, she thinks on her feet and makes sure she survives. I wasn't surprised at all at her decision to become a vampire. She is very strong willed and sensible. She knew exactly what her decision would mean, she wasn't about to blame anyone else, she took full responsibility. Zeke was a just a beautiful soul; the type of guy you always want covering your back. Katin was a brilliant character too, he was like a cross between Yoda from Star Wars and Brad Pitt in Fight Club. The following quote has to be my favourite in all the book. Just brilliant! Fight Club all over again! I really enjoyed the way the author showed the contrast between Alison's life before and after becoming a vampire. It gave such a clear indication of her true character. I did find the book dragged a little in the middle; I found myself wanting to speed the action up a quite a bit. However the ending definitely made up for it. I have to admit that I never imagined that the ending would occur in that way when I began reading the book. I can't wait to read the next book in the series. It really made a refreshing change to see a female vampire as the lead character! Ten brownie points awarded to Julie Kagawa! 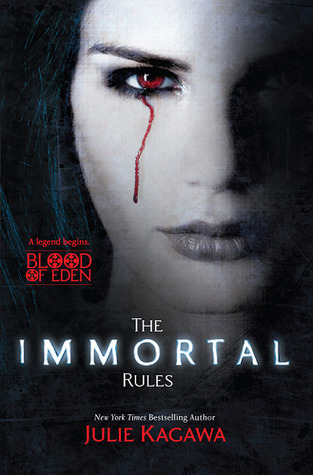 If you would like to win a copy of The Immortal Rules, then please enter your details in the Rafflecopter below. The competition is international and will close on the 5th of May. I have heard so many wonderful things about this book that I couldn't help but enter. Thanks for the giveaway! Cool :D I am in! Thank you for hosting this giveaway, Vivienne. I'll add this to my blog's sidebar. Even if it drags a little I'm so, so curious about Kagawa's vamps. The Iron King wasn't for me but I hope this one might be. Great review and thanks for the chance to win a copy in the giveaway! Thank you for the chance to win The Immortal Rules. I keep hearing fantastic things about it and your review keeps in theme with what I'm hearing. How fantastic Allie is and how it's not "just another vampire story". I can't wait to see what it's like myself.